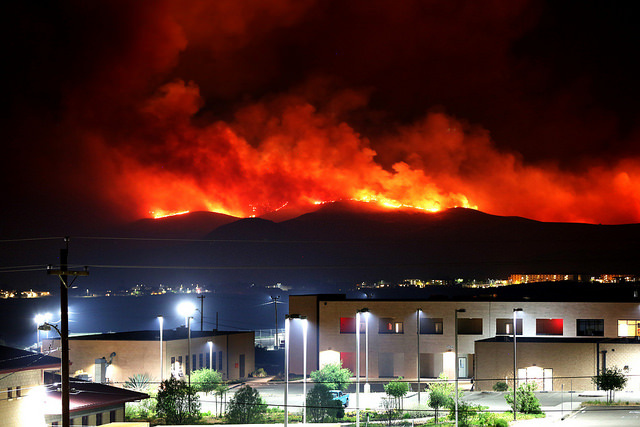 We are at the mercy of Mother Nature when it comes to these wildfires. First a lack of rain turns all the brush into tinder. Then excessive heat and winds supplied by the Santa Ana makes it virtually impossible to control the fires or put them out till the weather cools and the winds die down. The firefighters did an amazing job, however, in saving whole neighborhoods. They lost a house here and there, but whole neighborhoods didn’t go up in smoke with the exception of Harmony Grove. One of the houses that did go up was probably a result of the fact a window was left open. One thing I learned is that, if you have to evacuate, make sure all windows are closed. Even though a tile roof and stucco exterior will fend off embers, if one gets in the house through an open window, the whole house will go up. It’s a good idea to unplug TVs, computers and other appliances too. Bill Horn’s comments about arsonists were uncalled for. It just shows his ignorance to deflect the discussion from climate change to arson. In fact there was very little discussion of climate change throughout this ordeal. The media seems averse to discussing it. We were just lucky that the Santa Ana only lasted 3 days. If it lasted 2 weeks, we’d really be in trouble. Thanks for pointing out that regularly-occurring fires are a result of land use decisions, and that attempts to blame the fires on arsonists are wishful thinking. Every single-occupant SUV buzzing up and down I-15 daily adds a little fuel to the fire. Much of San Diego has a taste for what is called “back country,” so long as it’s a massive house on a hill with a lawn and Eucalyptus trees far from I-5 but close to I-15. One of my earliest jobs here was county reporter for the old Tribune, owned, like the Union, by the Copleys. I was keeping my eye on a proposed amendment to the then-General Plan that would have blown a huge hole in a preserve and allowed acre parcels somewhere south of Escondido. On the day of the hearing, after planning staff had strongly advised against the development, I called city desk and told them they could expect something from me for the next day. The city editor told me, “That happens all the time,” and asked me what was the story. I don’t see how the arson theory is incompatible with the climate change and land use theory. No matter how abnormally hot and dry it has been, a fire still needs a spark – literally – to start.